Lucknow is the largest city of the Uttar Pradesh state. It is the capital of UP. It is bounded by Barabanki, Unnao, Raibareli, Sitapur, and Hardoi. Lucknow has a large number of government and private institutions which offers bachelors to doctoral level courses in the different field of educations. Students from different areas of the country come here to pursue their higher education. According to the census 2011, the average literacy rate of Lucknow is 77.29 %. 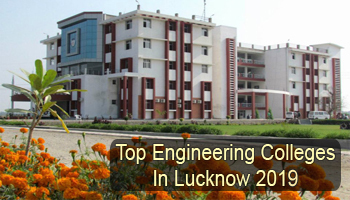 Here we are providing a list of top engineering colleges in Lucknow 2019. Sarvgyan.com is presenting a list of top engineering colleges in Lucknow city for the year 2019. Here we have included various government as well as private colleges which offer various engineering courses in the engineering field. Students can appear in JEE Main examination to get admission in B.Tech & B.Arch courses. Besides national level exam, students can also apply through UPSEE (UP State Entrance Examination). It is a state level exam organized by the AKTU. Candidates seeking admission in CIPET are required to qualify their own entrance test (CIPET JEE). For admission in PG engineering courses (M.Tech), students can apply on the basis of GATE scores. Engineering courses are offered in various specializations. Students can choose specializations in UG & PG engineering courses as per their interest. Some top specializations of engineering courses are Electrical Engineering, Computer Science & Engineering, Mechanical Engineering, Aeronautical Engineering, Electronics & Communication Engineering & Civil Engineering. If you have any other queries about Top Engineering Colleges in Lucknow 2019, you can leave your queries below in the comment box.